Or, possibly, red herrings: No candidacy is official until someone shleps the petitions down to Springfield. But there are a lot of preparatory steps that a serious candidate must take and some of these leave tracks on the Internet. One of the best places to look is in the Campaign Disclosure section of the State Board of Elections. Noodling around there this evening, I found that a campaign committee was recently organized in support of the judicial candidacy of Rosemont attorney Richard Karwaczka. An attorney since 2001, Karwaczka practices with the Law Office of Serio & Karwaczka, LLP. Frank J. Serio is Karwaczka's campaign chair. Joseph Chico is apparently contemplating a run in the 1st Judicial Subcircuit. This would be Chico's second bid for a seat there; he ran before, in 2000. 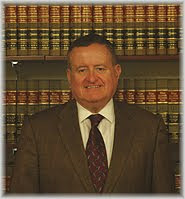 A lawyer since 1993, Chico is employed by Joseph Chico & Associates. Richard Crusor, Jr. is considering a run for one of the three seats in the 15th Judicial Subcircuit. A lawyer since 1980, Crusor is employed by the State's Attorney's Office. Crusor ran for judge twice before, in 1996 and in 2002. Michelle Hugghis Flagg, a lawyer since 2003, has organized a campaign committee in anticipation of a Circuit Court bid. She maintains an office on the 7900 block of South Racine Avenue in Chicago. A committee has been organized to support a judicial run by Russell W. Hartigan. Hartigan practices with the Chicago firm of Hartigan & O'Connor. He is the Treasurer of the West Suburban Bar Association and a member of the Board of Governors of the Illinois State Bar Association. Hartigan has also served as President of the John Marshall Law School Alumni Association. Hartigan filed for the Montelione vacancy in 2007, but withdrew. Another committee has been formed to support the candidacy of Judge Thomas V. Lyons II. The Illinois Supreme Court appointed Lyons was to the O'Malley vacancy in August 2008 (and, yes, I missed it). Before going on the bench, Lyons practiced with the Nolan Law Group. He joined that office in 2005 after nearly two decades with the Cook County State's Attorney's Office, where he had served as deputy chief of the civil actions bureau and chief of the Special Litigation Division. Prior to that, according to a December 27, 2005 Chicago Daily Law Bulletin article, Lyons was a top prosecutor in the Felony Trial Division. Finally, a committee has been formed to support the candidacy of Bradley R. Trowbridge. A Loop solo practitioner, Trowbridge concentrates in family law. A lawyer since 2000, Trowbridge was recently mentioned in a Law Bulletin article announcing the settlement of a suit for emotional distress arising from "a failed 22-year love affair" between a one-time law student and the former dean of a local law school. Trowbridge was one of the plaintiff's attorneys. LaGuina Clay-Clark, who is currently sitting by appointment to the Steele vacancy in the First Judicial Subcircuit, and Yehuda P. Lebovits, who was recently appointed to the Otaka vacancy in the Ninth Subcircuit, are among the 20 finalists for 10 vacant Cook County associate judgeships. Three other judges serving pursuant to Illinois Supreme Court appointments also made the cut, including William Edward Gomolinski (pictured at right). 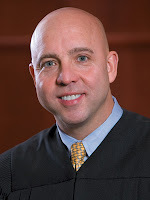 Gomolinski was recalled by the Supreme Court to judicial service after losing to Pat Rogers in a bid to keep a Fourth Subcircuit seat in the 2008 primary. Gomolinski earned endorsements from both the Tribune and the Sun-Times in that campaign. The other two finalists who are also currently sitting as judges are William R. Jackson, Jr., who was appointed by the Supreme Court to the countywide Riley vacancy, and Demetrios G. Kottaras, who was, like Gomolinski, recalled to judicial service by the Illinois Supreme Court after his 2007 appointment to the Lott vacancy expired. Aguilar was also a candidate in the Fourth Subcricut in 2008. Connolly was 'pre-endorsed' by the Cook County Democratic Party in 2008 in case any vacancies opened up after the formal slating. None did, and Connolly did not run. The names of these 20 finalists have been forwarded by Chief Judge Timothy C. Evans to the Director of the Administrative Office of the Illinois Courts. According to the Circuit Court press release, "Within 14 days after the Chief Judge's notification, the Director mails a secret ballot with the names of the candidates to each circuit judge. The judges then vote for one candidate for each vacancy to be filled. The judges must return the ballots to the Director within 14 days of the date the ballots were distributed." Honorable E. Kenneth Wright, Jr., Presiding Judge of First Municipal District. Judge Evans stated, "The selected candidates reflect the Committee's consideration of legal excellence and variety of legal experience as well as diversity of race, ethnicity and gender. The selection of these candidates ensures the court's continued commitment that litigants coming before the bench can be confident of being treated fairly and justly." Nearly every day I read a blog by comedy writer, director, producer, and sometime baseball announcer Ken Levine. Among his many credits are M*A*S*H and Cheers -- shows I actually watched, back in the day. When I stumble across a rerun on MeTV or MeToo I look for his name... and seethe with jealousy when I spot it. Levine published a list of laws on his blog in September 2007. The first of these dates from his days broadcasting Seattle Mariners games: "The lead off walk will always come around to score...unless it doesn't." It's hard to argue with that one. And this one strikes me as absolutely true as well: "If you’re telling a joke in a restaurant the waiter will arrive and interrupt the minute you get to the punch line." Actually, as judicial candidates are probably finding out now, it's hard to get anything said at all, complimentary or otherwise. I did find that the local papers were quite willing to take my money for advertisements. Today the line between article and ad has blurred, as candidates may be able to get an article printed in a local 'shopper'... for a price. As a consumer of judicial services (i.e., a practicing lawyer) and a wannabe myself (I've applied for associate judge many times since 1996) I have an interest in trying to provide an opportunity for all Cook County judicial candidates, of any party, to get their messages out. As time permits, I'll post information I find surfing the Internet. When someone contacts me on behalf of a campaign, I will try and respond as promptly as my 'day job' permits. I reserve the right to put my expensive Westlaw subscription to work, looking for past stories about candidates. There have been a couple of occasions, in the past, when I've found stories that weren't entirely favorable. I am not a paid journalist, though I'm a long-time dabbler. I didn't attend Medill. (I'll save my favorite Medill stories for Page Two... some other time.) I did have one journalism class at Loyola, taught by the late Al Gray, a former Tribune copy editor. He preached that it was a mistake for journalists to claim objectivity; that was an unrealistic goal, he said. Instead, a writer must try to be fair. So, to judicial candidates in Cook County looking for an opportunity to be heard: I will try to be fair. But, remember, we are all subject to Levine's Law. Oak Park solo practitioner Pamela McLean Meyerson has announced that she will file for the Riley vacancy in Cook County's 11th Judicial Subcircuit. That's a link to Meyerson's campaign website in the preceding sentence; her site has been added to the list of campaign websites in the Sidebar. The Supreme Court recently appointed Steven J. Fruth to the Riley vacancy. An article by Ken Trainor in the Wednesday Journal of Oak Park and River Forest is linked from the campaign website and cites Meyerson's community involvement. Trainor writes, "She served on the Festival Theatre board from 1989 to 1996, including two years as president. In 1999, she served as co-chair of the referendum campaign for the new middle schools, then as District 97's middle school volunteer coordinator. She also served on the Oak Park and River Forest High School Citizens Advisory Council and was a member of the Park District of Oak Park's Skate Park Task Force." According to the Chicago Daily Law Bulletin (March 5, 1999) Meyerson once served as director of alumni relations for her alma mater, the University of Chicago Law School. (Meyerson is a 1983 graduate.) The 1999 article indicates that Meyerson was in private practice in Oak Park at the time of this appointment; Meyerson told me in an email today that she left that position in June 2000. "I've been returning to U of C every fall since 2000," she wrote, "to help out with their Intensive Trial Workshop." Although most of Meyerson's career has been spent in a solo practice, she advises that she was "a commercial litigator at Antonow & Fink from 1983-1985 and at Goldberg, Kohn, Bell, Black, Rosenbloom & Moritz from 1985-1989." Meyerson is married to Charlie Meyerson, one time news voice of WXRT-FM and WNUA-FM, and currently the news director of WGN-AM. Former Evanston Ald. Steven James Bernstein has announced plans to seek election to the bench in the 9th Judicial Subcircuit. His campaign website is up and running and has been added to the Sidebar. According to his campaign website, Bernstein currently serves as "Acting General Counsel for the Illinois Criminal Justice Information Authority where he has worked for the past three years." A lawyer since 1971, Bernstein notes that he was a "co-founder and former President of the Evanston Bar Association" and cites his memberships in "the North Suburban Bar Association, Decalogue Society, Asian Bar Association, NAACP, and ACLU" as among his qualifications for the bench. Bernstein is married to Circuit Court Judge Jeanne R. Cleveland Bernstein. Steve Bernstein's former law partner, Jeanne R. Cleveland Bernstein was elected to the bench from the 9th Subcircuit in 2004. Steve Bernstein's campaign is being managed by Jonas Heineman. The campaign websites are beginning to pop up now, now that petitions are in circulation. This morning I came across the new campaign website of Yehuda P. Lebovits, recently appointed to the Otaka vacancy in the 9th Subcircuit. That's a link to his site in the preceding sentence; a link has also been added to the Sidebar. Some likely judicial candidates have websites up -- but not all of these have been updated since the 2008 judicial primary. If you know of any other Cook County judicial candidate websites that are up and running for the February 2, 2010 primary, please leave a comment or send me an email. Most Cook County judicial vacancies aren't really vacant. The Illinois Supreme Court can fill these vacancies by appointment, and often does. The persons appointed must seek election, either to the seats to which they were appointed, or to some other vacancy. Particularly in the countywide races, it all depends on who is slated by the Cook County Democratic Party. Sometimes the party will slate the appointed judge -- but not always. So here is a list of the vacancies and, where known, the identity of the person appointed. If no name is indicated, it may mean that the vacancy has not been filled -- it at least means that I have been unable to ascertain who has been appointed. Vacancy of the Hon. 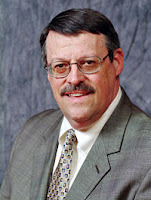 Ronald C. Riley -- William R. Jackson Jr. Vacancy of the Hon. Thomas P. Panichi -- George Scully, Jr. The Illinois Supreme Court has appointed Steven J. Fruth, an attorney with the Law Office Of Dale J. Sherman, and a lawyer since 1976, to fill the Barbara Riley vacancy in Cook County's 11th Judicial Subcircuit. The court's order provides that Fruth's appointment will be effective September 1, 2009. It will terminate December 6, 2010. Petitions aren't the only things that serious judicial candidates should be wrestling with right now. Both the Chicago Bar Association and the Alliance of Bar Associations for Judicial Screening have announced plans for early screening of judicial hopefuls. Right now, the Chicago Bar Association is focusing on candidates hoping to appear before a party slating committee. That link will get you to the candidate information page on the CBA website; from there you can access the Candidate Questionnaire (a Microsoft Word file) and other relevant forms. Visit that page before you contact the CBA's Therese Kurth at tkurth@chicagobar.org. Meanwhile, the Illinois State Bar Association's Joyce Williams (who coordinates Alliance screenings in Cook County) advises that of the Alliance has also implemented an early-decision review process for judicial hopefuls. The Alliance is inviting applications from candidates who have not already been evaluated by the Alliance bars and all sitting judges seeking a higher office to submit applications for "early review." Applications will be accepted beginning September 1 and must be submitted by no later than October 12 in order to qualify for early review. (The absolute drop-dead date for submission of a questionnaire to the Alliance is November 30. According to Ms. Williams, "any late submissions will result in a rating of 'not evaluated' or 'not recommended/qualified' if the candidate decides to run in the 2010 primary election.") Williams said the Alliance early review is not for slating purposes. The Alliance questionnaire (also a Word file) can be accessed from this page on the ISBA website. Candidates should visit that page before directing any questions to Ms. Williams at jwilliams@isba.org. According to his campaign website, Judge Thaddeus L. Wilson will be a candidate for the Coleman vacancy in Cook County's 1st Judicial Subcircuit. A former law partner of 21st Ward Alderman Howard B. Brookins, Jr., and a judge since August 2007, Wilson was initially appointed by the Illinois Supreme Court to the Montelione vacancy. He lost his bid to keep that countywide seat in the 2008 primary to Debra B. Walker but was appointed by the Supreme Court to the Coleman vacancy on November 18, 2008. A fundraiser is being planned for Judge Wilson on August 27. Tickets are scaled from $150 to $1,000 (for a 'sponsor' designation). For further information call (312)244-3786, ext. 1. Judge Wilson's campaign website has been added to the Sidebar. The campaign also has a Facebook page. Herewith a link to the 2010 Election and Campaign Finance Calendar compiled by the Illinois State Board of Elections. The silly season is officially underway: Petitions may now be circulated for the 2010 primary. Candidate filing opens October 26 -- and closes November 2 -- all for jobs that don't start until December 6. That's December 6, 2010. The primary election is February 2, 2010 -- Groundhog's Day. If things go according to form, virtually all Cook County judicial races will be decided that day: There will be very few contests in the November election. As a general rule, the nominee of the Democratic Party selected on February 2 will be sworn in as a judge on December 6, 2010. Here's a link to the 2010 Candidate Guide compiled by the Illinois State Board of Elections. Vacancy of the Hon. Thomas F. Carmody, Jr.
Additional vacancies may be added to this list, depending on when they occur.